We have been hearing such gossips all over Karachi since last two weeks. Don’t you know why? 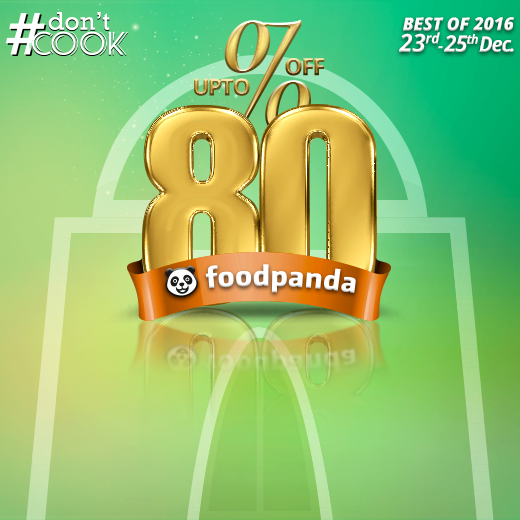 Because foodpanda is offering up to 80% Discounts on more than 200 restaurants nationwide! December 23rd to 25th have been declared as three days of no cooking. Celebrities, bloggers, partner restaurants and customers – all seem super excited, with their mouths drooling and fingers crossed, to see what big discounts are cooking up at foodpanda. Yummm.. I’m ordering this for lunch today! 50% off on all Pizzas! This 35% Flat on POW is just WOW! Give your weekend a healthy start with Flat 80% on Friday. Everything half the prize! And yes, on Friday only. Eat pizza to your heart’s content this Friday! We are having pizza for lunch and pizza for dinner as well! Yes. FLAT 80% off. Eat all the pizzas you can! Do share your food ordering plans for all three days in the comments.